Having the best oil cleaner available is great. But when can you be certain that your oil is perfectly clean? Taking oil samples is a delicate procedure, and oil analysis from a professional lab might take several days. Our EXCEL series combine our portable and mobile filter rigs with a laser monitoring device/particle counter. EXCEL series = On-line monitoring + Oil Cleaning = immediate results. Filter your oil just as long as necessary to get it perfectly clean. No messy oil samples, no waiting for oil lab oil analysis. TIP: recommended cleanliness levels. Check and compare for yourself. Ideal for a PRO-ACTIVE maintenance program. Connect to any kind of oil driven machine and check the level of contamination. Start filtering that oil and check the digital particle counter. Once you reached your target cleanliness, disconnect and go to the next one. Perfect for service flushing and for cleaning fresh oil when (re-)filling a hydraulic system. 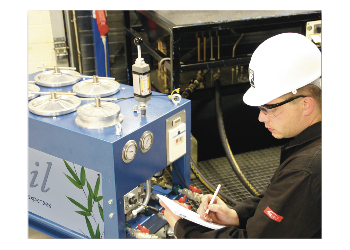 Monitoring all your oil driven systems and perform additional cleaning if required. Built-in particle monitor = MEASURE ON-THE-SPOT = NO GUESSING anymore - NO WAITING for oil analysis lab reports! This is an important advantage because now maintenance technicians can check about the contamination level on-the-spot, and act accordingly. Optional equipment: Quicktoron air bubble remover; improves and increases filtration & monitoring efficiency and accuracy.